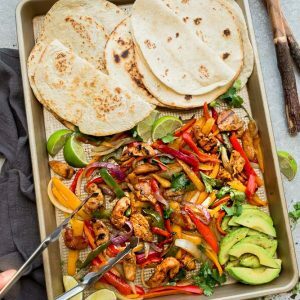 Sheet Pan Chicken Fajitas - a quick, simple and tasty one pan meal perfect for busy weeknights. Best of all, ready in about 30 minutes with minimal clean-up with low carb options. Preheat oven to 400 degrees and grease a large baking sheet (mine was 18 x 13 - use two if necessary). For easier cleanup, you can also line with parchment paper or foil. Slice bell peppers and onions into thin strips. Spread them in an even layer on the baking sheet (do not overcrowd - use two sheet pans if necessary). Drizzle with 1 1/2 tablespoons olive oil and season with remaining seasonings. Toss to coat well. Push the vegetables to the sides of the pan and add the chicken to the pan. Try not to overlap too much and keep everything in a single layer. Bake in preheated oven for 17-22 minutes (flipping chicken and tossing vegetables halfway through) or until peppers are tender and chicken is cooked through and reaches 165 F. (You can remove vegetables first if chicken is not cooked yet). To bake tortillas: wrap in aluminum foil and add to the top rack of oven while the chicken is baking for about 5 minutes.